post-title Win a 3 course meal for 2 and craft beers at the Sweetman history night. Win a 3 course meal for 2 and craft beers at the Sweetman history night. Home / 2016 / Win a 3 course meal for 2 and craft beers at the Sweetman history night. We’re teaming up with JW Sweetman to offer you the chance to win one of 2 pairs of tickets to the JW Sweetman history night this Wednesday the 13th of January. The night includes history discussions, including the history of the building, the original Sweetman brewery, the 1916 rising, and other major historical events relating to the city. There will be a 3 course meal of local Irish produce paired with Sweetman craft beer brewed on site. 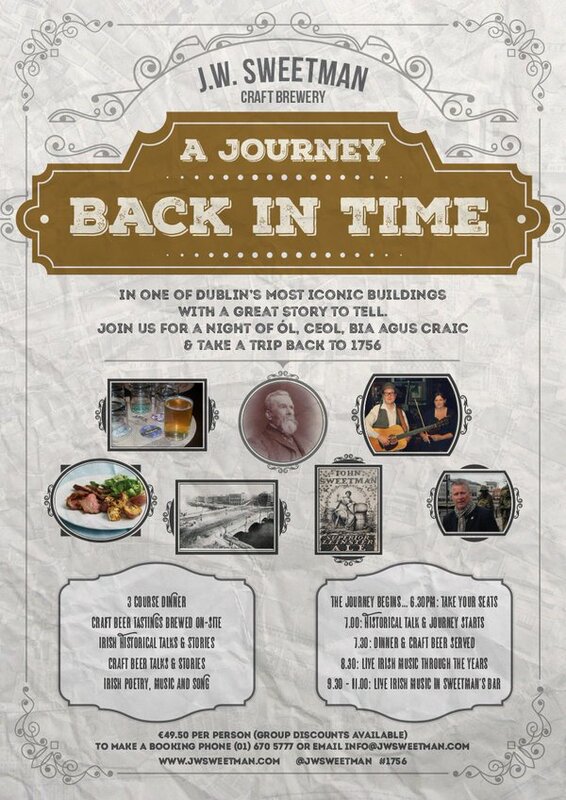 Between each course you’ll be treated to some historical discussion and live traditional music. We were fortunate enough to have tried the evening last year and we really enjoyed ourselves. you can read about it through this link. To be in with a chance of winning, simply comment below or on facebook telling us your favourite figure from irish history.